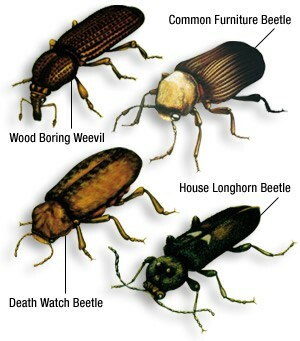 There are four main types of woodworm in the UK, all of which we have spotted in Cornwall and if this is your first time learning about woodworm, you might be surprised to learn that they are all beetles. The reason for this is that “woodworm” is not actually a species in itself, but is instead the collective name used for the whole range of wood boring beetles. The beetles do spend most of their life, up to about 6 years, in the larval stage eating through wood, whereas they only spend a few days or weeks as adult beetles. It’s not as misleading as it may first seem to call them woodworm therefore. However it does depend on the type of beetle that you are dealing with as to what the best woodworm treatment course will be. Signs of woodworm usually consist of holes in the wooden item, with live infestations showing powder (faeces) around the holes. The size of the holes varies, but are typically 1mm to 1.5mm in diameter for the most common household species. Adult beetles which emerged from the wood may also be found in the summer months. Typically the adult beetles lay eggs on, or just under the surface of, a wooden item. The resulting grubs then feed on the wooden item causing both structural and cosmetic damage, before pupating and hatching as beetles which then breed, lay eggs, and repeat the process causing further damage. As the beetles evolved consuming dead wood in various forest habitats, most grubs, if not all, typically require that the wooden item contain a higher moisture content than is normally found in wooden items in a typical home. A building with a woodworm problem in the structure or furniture probably/possibly also has a problem with excess damp. The issue could be be lack of ventilation in a roof space, cellar or other enclosed space within an otherwise dry building.